Product: Miro Model 1.5" High Poly Spacer (1). Price/Each. 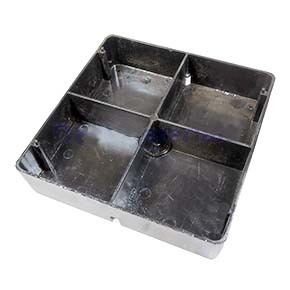 Description: The Model 1.5 Spacer is 6" square and the base is gently rounded to prevent gouging the roof. The outer edges are raised 1-1/2" and increased elevations may be achieved by stacking Model 1.5 on 1or 2 spacers, each with a height of 1-1/2". Four drainage ports are provided to prevent ponding within the device. The dimensional area resting on the roof is 5-7/8 inches square and 34.52 square inches exist of contact roof support. Size: The deck base is 6" square, the top of the spacer is 1.5" high. Max Pipe Clearance: Pipes supported by the Model 1.5 have a clearance of 2.33". Each 1.5 spacer increases the clearance of the pipe by anadditional 1.5". Max Load Weight: Maximum load weight may not exceed 80 lbs. for the 1.5 pipestand. Spacing: Manufacturer's recommended spacing is not to exceed 10 feet centers depending upon the load. Make certain each pipestand is properly elevated to even load weight at all pipestands. Rooftop Pipe Support, Fits 1.5 inch Pipes (1.9 OD), 6x6 inch Polycarbonate Base, 2 inch Standoff / Clearance. 63/Case. Price/Case. Miro Model 1.5 Polycarbonate Rooftop Pipe Support, Fits 1.5 inch Pipes (1.9 OD), with 6x6 Polycarbonate Base. Provides 2 inch Standoff Height. Price/Each. Miro 1.5 Spacer. 1-1/2 High 6x6 inch base is used with Miro 1.5 Pipe Support to add additional height. 32/Case. Price/Case. Miro 12 x 12 x 1/4 inch Rubber Support Pad. Provides 1/4 inch protective barrier between roof membrane and rooftop equipment. Constructed of 100% recycled Rubber. Price/Each.